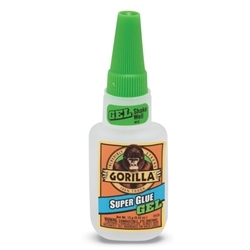 Gorilla Super Glue Gel is a high strength‚ no-run‚ quick-set glue—great for vertical applications. Rubber-toughened to prevent cracking under pressure‚ it bonds metal‚ wood‚ paper‚ ceramics‚ leather and most plastics. An anti-clog cap with metal pin ensures an airtight seal. Glue dries in seconds‚ with full cure in 24 hours.